Recover that trophy buck with a well-trained tracking dog! Over 40 years of experience training dogs for tracking and search and rescue operations. The purpose of this website is to provide factual information on Blood Trailing Dogs, and to aid in their training. Blood Dog is just another name for a dog that is performing a tracking function. For example, if I were to say that I train tracking dogs, most hunters wouldn't pay me a bit of attention. But, if I say I train Blood Trailing Dogs to find wounded animals, I have their undivided attention, immediately! The fact is that the Blood Trailing Dog is performing the same discipline as one that tracks human beings. While many may believe that teaching a dog to track a wounded animal is easy, I can assure you that there is a lot of planning, testing, work and time involved in the training of a dog. The dog must first be tested for his "drive." Drive is the dog's desire to follow a track or trail of a scent. The training begins with laying a track and running behind the dog on three separate tracks each day. This is performed five days of each week, for a minimum of four weeks, ensuring that he is following the correct scent trail. You cannot just spray a little blood here and there and expect a dog to react to it and locate the target. The animal's scent is absorbed into the blood and scent is what you should be the focus of your training. The dog's nose is the key to all of his training, and although it is the first sense to begin functioning at birth, he has to be taught to perform the tracking discipline on command. That is where my expertise comes into play. Many who wrongly believe the dog should be tracking blood may think, "This is hogwash!" Well, it's a fact, and remember, I said I would provide factual information. Trainers that will have you believe that you need to maintain a supply of blood or special boots in order to train your dog are very misguided. How can I say that? Well, let's first take a look at scent and its function. Scent is created from dried skin particles known as scarf. Scarf will waft from the body, and that of any animal, at a rate of 10,000 particles per second. Each animal has a distinct aroma of scent associated with its species and individuality. 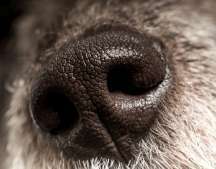 Simply put, everyone and every animal have a distinct odor which can be identified via smell. The acute abilities of the dog's nose aid it in identifying those differences. Blood is on the inside of the body, and it's wet. No dried skin particles can develop inside the body, only on the outside. So how does the dog know what to search for? When the blood from a wounded animal drips from the skin of that animal, its scent is absorbed within the blood. When your dog is brought to the spot where blood appears, he is directed to locate that particular animal. If trained properly, he will only track the animal whose scent he smells. Does this really work? Consider this, when tracking a wounded animal, generally the blood droppings will cease, but the dog continues to track the correct animal. Why? He is following the scent (dried skin cells) trail left behind by the animal, and not just its blood droppings. If you can identify the location where the deer was standing when it was shot, the dog will track that particular animal, even if there is not visible blood. When training a dog, if blood collected from one animal is being sprayed, and a piece of hide from a different animal is being used as the drag, it can and usually does, confuse the dog, making training a monumental task. The reason is that the blood is not collecting the scent of the hide. If the blood was allowed to drip off the hide, that would make a huge difference. Why confuse the dog? Simply use portions of the cape of a particular animal as the drag and teach the dog to track that particular scent. Each time you change the hide, you have a different scent, and the dog knows it. With that said, you don't need boots with hide strapped to them to lay a track. Remember, you want the dog to track one particular hide or animal, so don't mix the scents. It's just causing more confusion. You're making the dog work his nose harder than needed. A dog that is trained by us will follow the scent of anything you put it on. For example: I trained a dog for a friend to find wounded deer, and the dog worked fantastically. 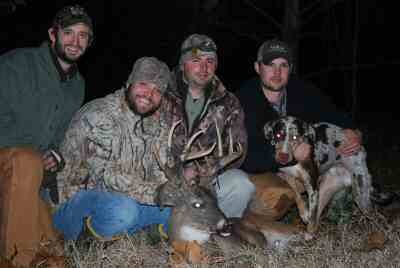 One evening I received a call from them that one of the hunters in their group left his stand and became lost. I asked if anything was left in the stand. They said he left his gloves behind. I described the manner in which to present the scent to the dog, and 30 minutes later the hunter was found. Same dog, same task, different scent, same results.